I can just hear my readers asking themselves that now. And the answer is, “Yes, I did.” But I felt the need to follow it up, in a more specific way, about a particular kind of hatred. But there is a big exception made in our culture — and some others — for this taboo on criticizing, fairly or not, a religion and its culture. You may have already guessed the exception. Yes, it’s for the Church of Jesus Christ of Latter-day Saints. The Mormons. “Joe Smith just made all that up, about being visited by the Trinity, and having a new bible revealed to him, and all that other nonsense,” some people will sneer. Sometimes they’re people who were once Mormons, but then left the faith, raining curses upon it over their shoulders as they departed. Fundamentalist Protestants especially take a very dim view of the Mormons. I can still recall, many years ago, my first landlady scoffing at Joseph Smith. “He wasn’t no prophet!” she declared. For those not familiar with the history of the LDS church, Joseph Smith was an upstate New York farm boy who said that he was visited by the Holy Trinity in a woods near his family’s home in the 1820s. He said the Godhead told him to found a new Christian faith, one that went back to the days of the Apostles, because, according to Smith, “Christianity had lost its way in the years just following that time.” In other words, Smith said he was told that the Roman Catholic, Orthodox Christian, and the various Protestant churches of the 16th through 19th Century were false prophets, so to speak; that they had strayed from the true faith as preached 2,000 years ago by Jesus Christ. So in April 1830, Smith formed what he called the Church of Jesus Christ of Latter-day Saints. The new church, which started with only seven members, began to grow rapidly. 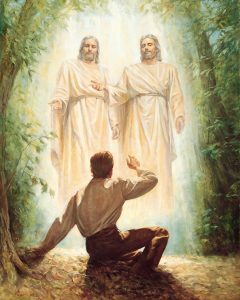 Whether Joseph Smith actually saw a vision of the Father, Son and Holy Ghost, or whether he “made it all up,” as the Mormon haters love to insist, is impossible to prove, one way or the other. And, as a non-Mormon who isn’t likely to ever become LDS, I won’t voice an opinion on that. People of a particular religion, throughout history, have often sneered at and ridiculed the beliefs of ANOTHER religion. But I will say this: Despite all the imprecations hurled at Joseph Smith, and his followers, right down to the present day, the Mormons have proved some things, as an ethnic group, as many experts on such things now see them. They tend to be honest and truthful; they’re certainly not afraid to work; their divorce rate is lower than that of most other branches of Christianity; and despite the attempts of so many anti-Mormons to paint them as “weird,” they know how to have fun, in their own way. Google the LDS on YouTube, and you can find videos of Mormon missionaries break dancing (often very skilfully, too); of other young Mormons also dancing; of LDS members singing (remember the Osmonds? ); of young members playing basketball (they’re good at it; each local meeting house has a basketball room of some size with a hoop in it). They can be funny, too. Look for “Studio C” on Youtube, and you’ll see some hilarious skits put on by students at Brigham Young University who are members of that theatrical troupe. The most outrageous “hate-Mo” publication (that’s a Utah phrase; it means, “Anyone who hates the Mormons”) is the Salt Lake Tribune, the largest newspaper in Utah, which was founded in the 1870s by a Catholic family who did not like the Mormons. The LDS had founded what later became the state of Utah in 1847, and other settlers who were non-Mormon had begun to stream into Utah a few years later. And that began what you might call “Utah’s great divide.” Nearly all the Mormons in those days were White; a large majority of the non-Mormon settlers were, too. So it wasn’t a racial divide; it was religious and cultural. The non-Mormon settlers saw the Mormons as “strange,” as a “cult” with reprehensible beliefs and practices. The Mormons saw the settlers as “Gentiles,” the word they used to use to describe non-Mormons; as interlopers into the future state that the LDS felt THEY h ad built. That chasm doesn’t seem to have narrowed any in the 150-odd years since then. Many of the non-Mormons in Utah today seem to hate the Mormons, if you can judge by the comments posted on most articles concerning the LDS, in some way, on the Salt Lake Tribune website. The Trib — “LibTrib” as many Utahans who don’t like the newspaper and its blatant slant against the Mormons call it — goes out of its way to publish any “news” story it can find that somehow puts the LDS church in a bad light. Racism (black men couldn’t become Mormon missionaries until 1978); misogyny (LDS women can’t serve as Mormon officials, except over the women’s separate organizations); Mormon families having “too many” children (their fertility rate is significantly higher than the national average); you name it, and if it can be spun somehow to malign the Mormons, the Trib is willing — no, EAGER — to publish it. And the regular posters of comments on the website dearly love the anti-Mormon stories, because those give them a chance to post sarcastic, snarky, defamatory comments about that church that they hate so much, and the people who are members of it. A special target are those who are its leaders at any given time, who the “Hate-Mo’s” view as lying, scheming “capitalists” who use religion to enrich the church and, by implication, themselves. The most recent example of that which I have noticed is that, when the LDS announced that it was sending assistance — physical, supplies, and monetary — to the various areas hit by the horrible hurricanes of this September, the haters complained that either (a) the church did not give enough, considering its net worth; or (b) the Mormon rescue crews and missionaries on the scene were only going to help members of their own faith; or (c), the church should not have publicized its charitable work, because doing that was “patting itself on the back,” and trying to generate favorable publicity. Which brings me to the main reason that the Hate-Mo’s in Utah don’t like the Mormons. The LDS is TOO SUCCESSFUL! In 187 years of existence, the church has gone from a farm boy and the visitations by the Holy Trinity, and just seven original members, to nearly 16 million members worldwide, at least 156 Mormon temples, beautiful and astounding, around the world, an average income per family higher than the U.S. average, and a higher average IQ also. How dare they?! The Mormons, by virtue of following the tenets of their faith, one of which is to avoid tobacco and alcohol; by stressing families, working hard, and being honest; and succeeding much better than members of many other religions in accumulating wealth, building successful businesses, and other measures of living a “good life.” One of their best-known sayings is, “See the good in the world.” And the Hate-Mo’s are SO jealous! Practicing Mormons, or non-Mormons who hold a favorable view of them, sometimes post comments about the anti-Mormon stories on the Trib’s pages, taking issue with the hateful comments and bigotry voiced by the Hate-Mo’s. And every time one does, there are normally 10 to 15 replies to that person posted, all of them negative toward him or her. I used to be one of those non-Mormon sympathizers who defended the LDS with my comments, and argued with the Hate-Mo’s. The editor in charge of public comments finally banned me from posting any more. Guess I was making too many Hate-Mo’s look nasty and stupid. One of my proudest achievements, getting banned from the LibTrib. Like the Salt Lake Tribune. Enjoyed reading your well written, well researched column, Old Corporal. Like your ‘live and let live” attitude.